Conform to relevant, RAL, DIN, AFNOR and draft CEN standards. Choice of sizes and colours to suit your needs. Manufactured in accordance with the strictest European specifications including EN-840, RAL and DIN 30760. High quality, high density polyethylene. Resistant to UV, frost, heat and chemicals. Compliant with noise reduction regulations. Cadmium free and can be easily recycled. 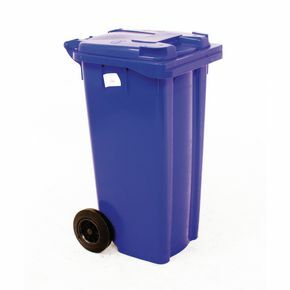 If you are looking for a wheelie bin for commercial or residential use, these offer the perfect solution for you. Available in a range of colours; blue, green, grey, yellow, brown and red - these are tough and durable bins made from high quality and high density UV stabilised Polyethylene offering the bins a longer life. The bins also benefit from being resistant to UV, frost, heat and chemicals. Along with being manufactured in accordance which the strictest European specifications including EN-840, RAL and DIN 30760, they also conform to relevant RAL, DIN, AFNOR and draft CEN standards. With them you can be confident they are reliable and of the highest quality. Other specifications include their availability in varying sizes; 80L, 120L, 140L, 240L and 360L, offering a capacity to suit your business or residential requirements. We can assure that these bins are compliant with noise reduction regulations, are cadmium free and can be easily recycled, ensuring that they are better for the environment. If using indoors please measure your doorways to know what size bin will fit through the internal doors, measurements for the individual capacity sizes can be found under the technical tab.